For a limited time, save $10 – $30 off TurboTax 2017 (depending on version). This special deal for newly released software won’t last long. TurboTax was released on November 9, 2017, just in time to get you started on preparing to file your 2017 Income Tax Return. 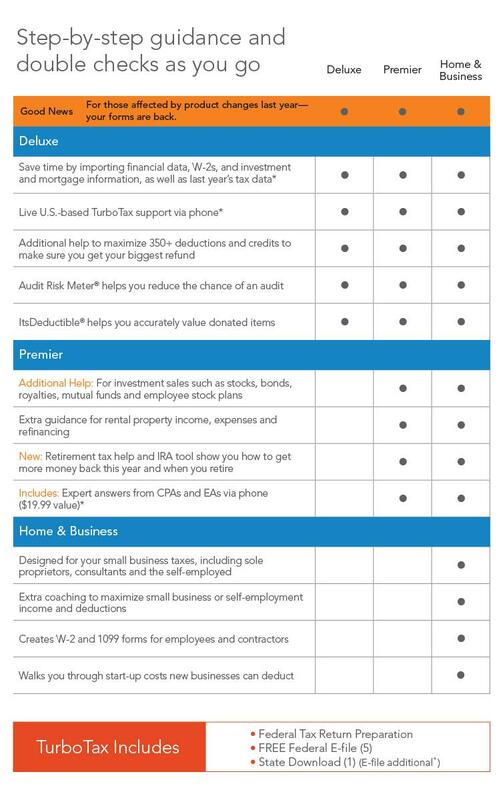 The first question to ask yourself is “Should I get the Desktop or Online version of TurboTax?” What’s the difference? Both versions are easy to use and will get you the biggest refund. The online version is the one you use through your web browser by going to TurboTax.com. The problem with the online version is it charges you $36.99 extra to file a state tax return. The Desktop Version of TurboTax is a program that you download and install on your computer. It comes with a free state tax return in addition to up to 5 federal tax returns, so you get a lot more for your money. Overall, it’s much cheaper than the online version. You don’t need a coupon to get the best deal on TurboTax 2017. Many of the coupons floating around out there are gimmicks and don’t really get you the best price. What you really need to pay attention to is whether or not the version of TurboTax you are purchasing includes the state tax return. Since many of the TurboTax 2017 versions don’t include the state tax return, you end up having to pay an extra $36.99 to file your state return. We work hard to make sure you always get the best deal for all editions of TurboTax. The best prices available are featured here on this page. You don’t need a coupon to get a discount on TurboTax 2017. Coupons for TurboTax are usually gimmicks and don’t save you any money. To make sure you’re getting the best deal, instead of a TurboTax coupon, just make sure the version you buy includes e-file for your state return, then compare prices with other websites. We try to make sure TopFinancialTools.com always has the lowest price anywhere. TurboTax is the #1 most popular tax preparation software because it makes filing taxes so easy, anyone can do it. TurboTax asks easy-to-answer questions and figures out your taxes for you, so you don’t have to be a tax expert. You can download TurboTax at a big discount and get started on your tax return today. TurboTax Deluxe is the most popular version. Its easy-to-use step-by-step guide ensures you don’t miss anything and guarantees you the biggest refund possible. Whether you are single and filing a simple return or married with children and own a small business, TurboTax has a version that’s right for you.